In United States politics, a government shutdown occurs when Congress fails to pass sufficient appropriation bills or continuing resolutions to fund federal government operations and agencies, or when the President refuses to sign such bills or resolutions into law. In such cases, the current interpretation of the Antideficiency Act requires that the federal government begin a “shutdown” of the affected activities involving the temporary leave of non-essential personnel and reduction of agency activities and services. Essential employees are still required to work without pay until the government reopens, when they may then receive back pay. These employees may include medical professionals in the Veterans Hospitals and TSA agents. Currently, the federal government has been on a shutdown since 22nd December 2018 over proposed funding for a US–Mexico border wall. This has become the longest in US history on 12 January 2019 after surpassing the 21-day shutdown of 1995–1996. The deadlock occurred when Trump sought to include $5.7 billion in funding for a border wall as part of the US government’s spending budget, but faced objections from Democrats over questions on the effectiveness of the proposed wall and the amount required to fund it. A senate vote on the proposed spending bill failed to secure a majority vote to pass it through to Congress. As of 23 January 2019, this shutdown is in its thirty-second day. Approximately 420,000 federal workers were required to work without pay, while the remainder were given temporary leave. 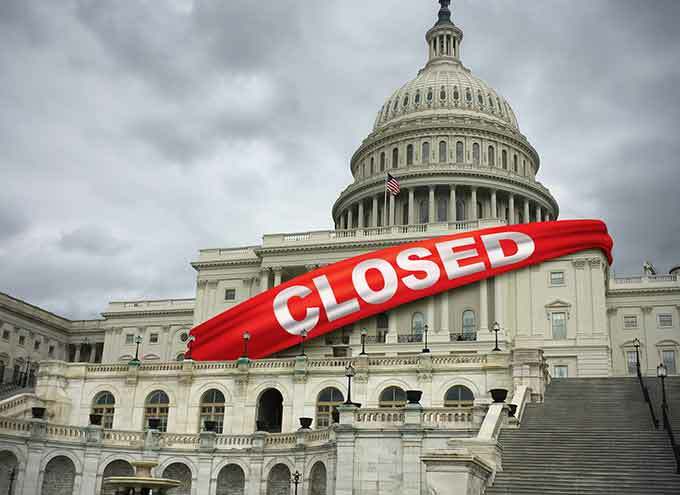 The extended shutdown has raised considerable financial uncertainty for federal workers. Polls show Americans want an end to the partial government shutdown as it enters its 33rd day.